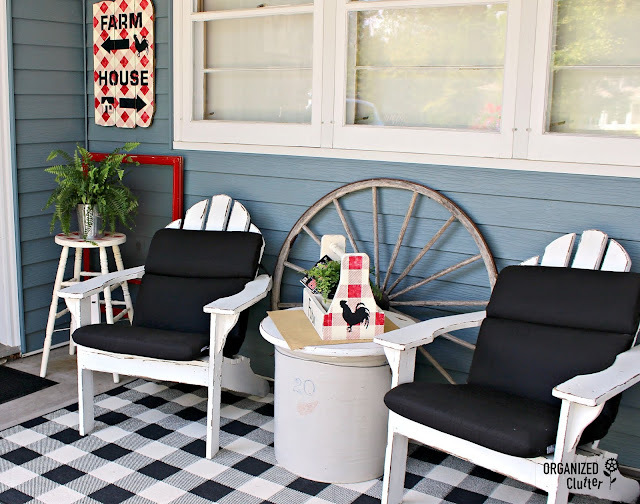 Today I am sharing my 2018 covered patio decor! If you have been following along this year, you will remember I have been stenciling a lot of thrift shop purchases with buffalo checks, like this child's chair. Details HERE. Also the rooster stenciled sign on a pedestal. Tutorial HERE. AND the farmer's market sign. Info HERE. Since my stenciled window screen planter box is facing north on the patio, and in the shade all day, I have added two Boston Ferns to the box. 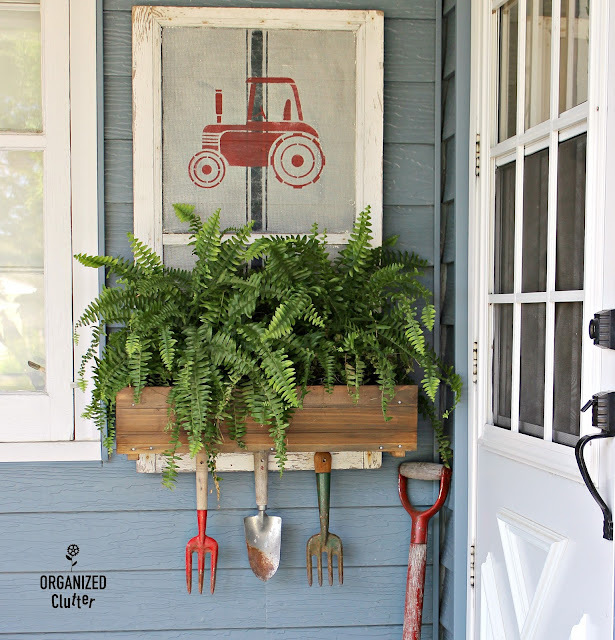 If you want to make an old window screen planter box like mine, all the details are HERE. My vintage garden tools are hanging from finishing nails in the bottom of the window frame. 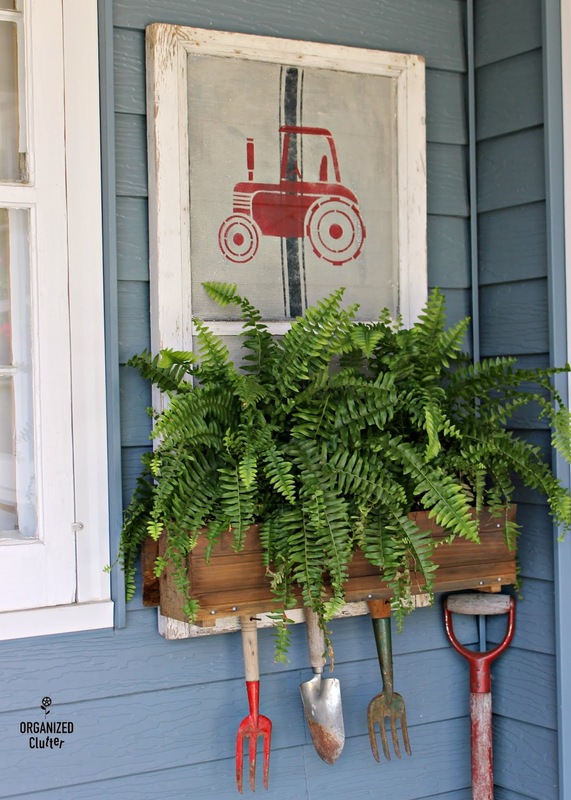 Other decor on the stoop include a vintage oil can, a Cretan Brake Fern, and an old spade shovel. I love my new buffalo checked rug! I opted for black and white chair cushions and rug, as reds can be hard to match. The rug is a 5'3" x 7'6" indoor/outdoor Marina area rug from Oriental Weavers. The buffalo check tool box project steps are outlined HERE. An Austral Gem Fern is in a crock in the toolbox. A crossword puzzle book is also in the toolbox ready for a quick break in the Adirondack chairs. More projects here in the corner. Do you remember the stool and stenciled tea towel? Details HERE. An old red window screen is propped up against the wall behind the stool. A Boston Fern is on the stool. Layering is a must. 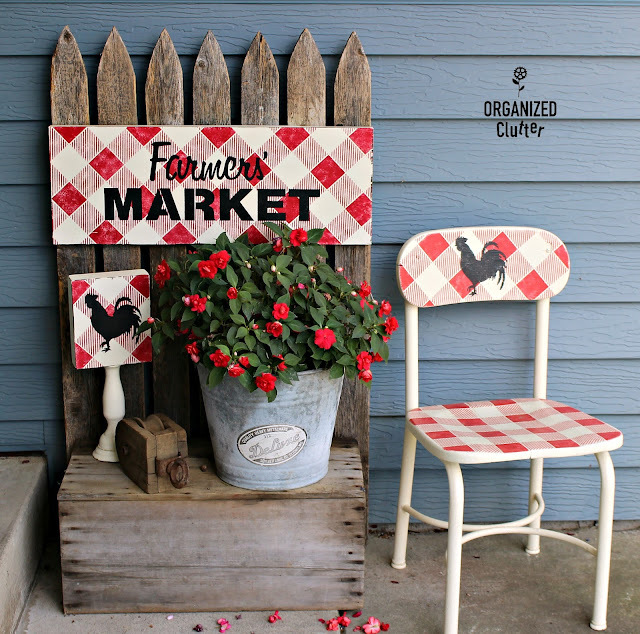 Above the stool is a garage sale upcycled sign I stenciled HERE. 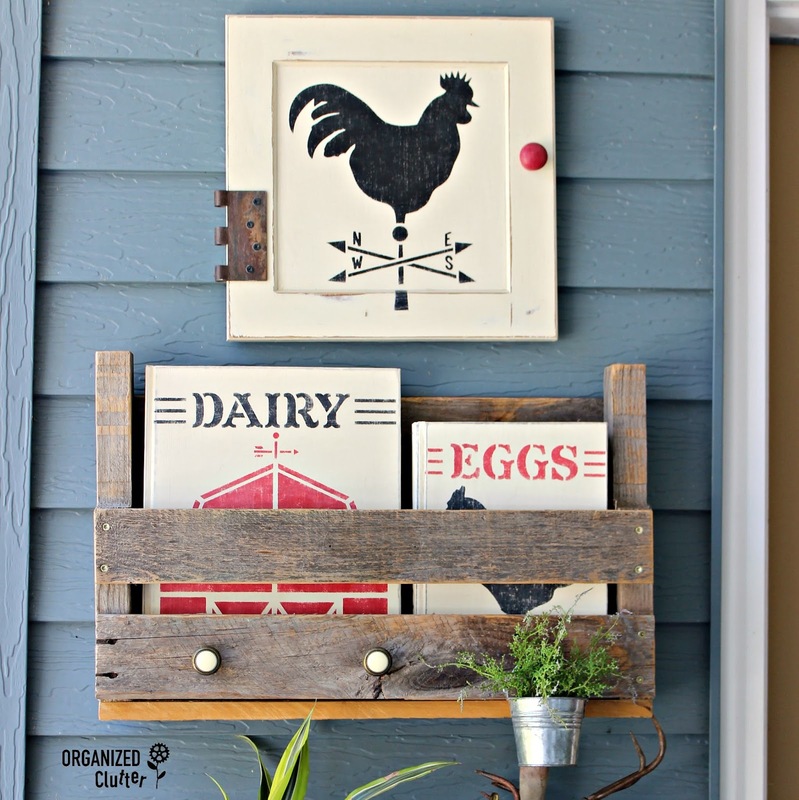 The cabinet door with black rooster vane was a fun project that I stenciled HERE with a cabinet display door I found on sale at Menards. 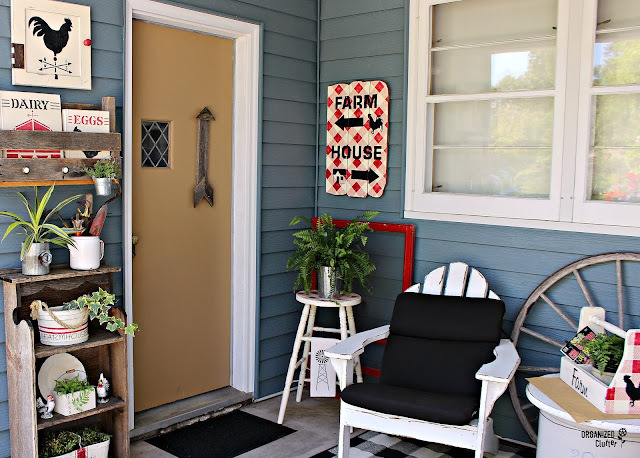 The farmhouse books were thrifted books that I transformed with paint and stencils HERE. 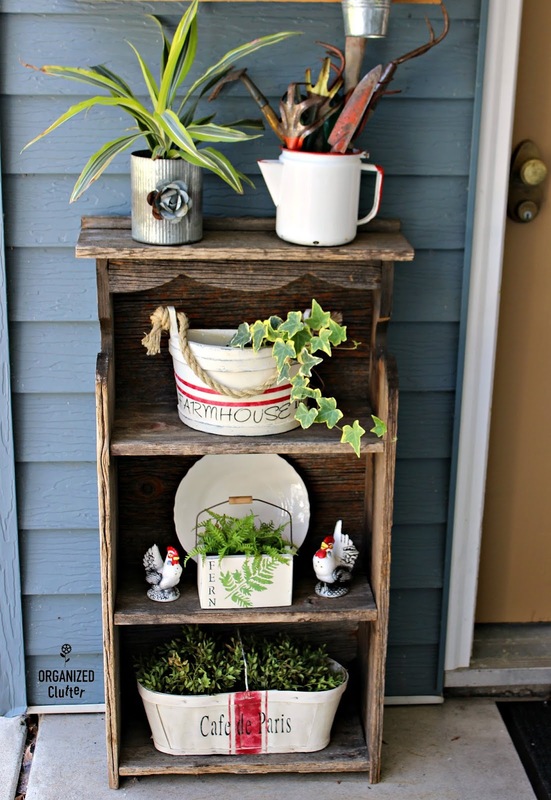 This barn wood shelf holds three planter boxes/baskets, ALL upcycled rummage sale projects. 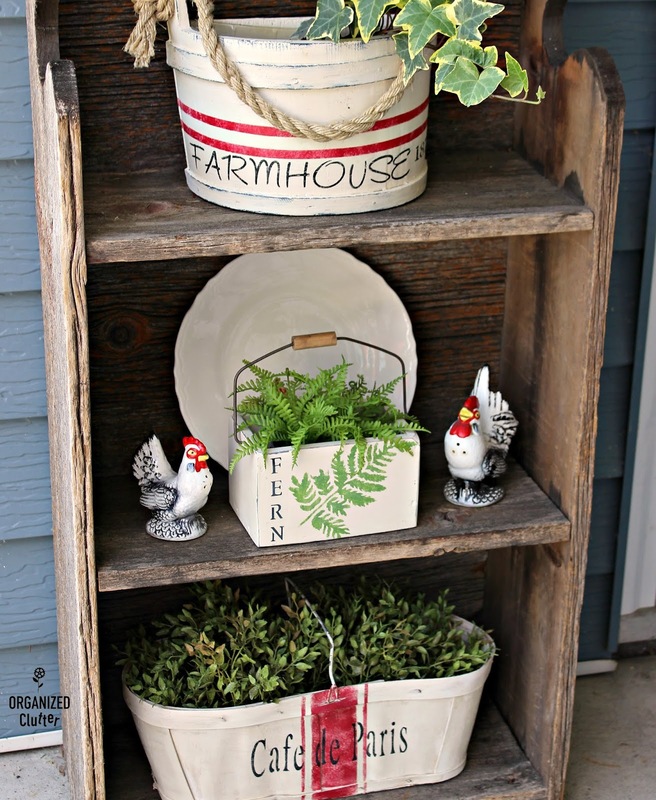 Farmhouse planter with ivy project HERE. 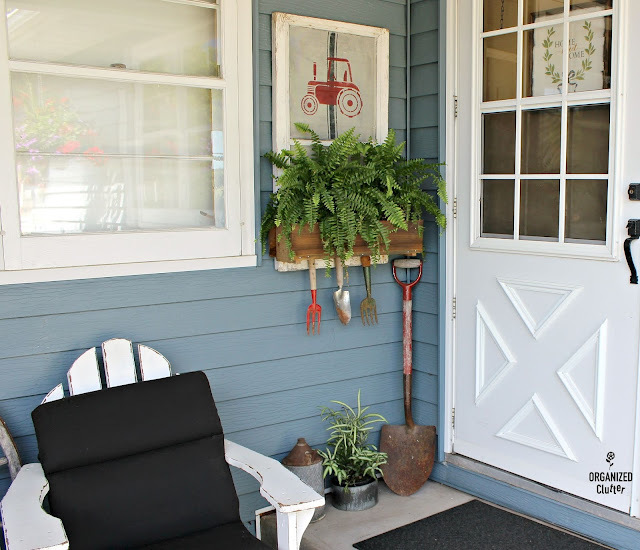 A few of the planters have faux plants but most of them are live ferns or houseplants. I think this year's covered patio may be my favorite. You can get your own *Old Sign Stencils Buffalo Check Stencil HERE. Here's a short video taken with my ipad of my covered patio! Positively warm and welcoming Carlene! In the overview photos, I love that you can open your curtains/shades and get an outdoor view inside the house. Wonderful! Love the check carpet as well. :) Thank you for the fun tour! You have such a cute patio for summer. 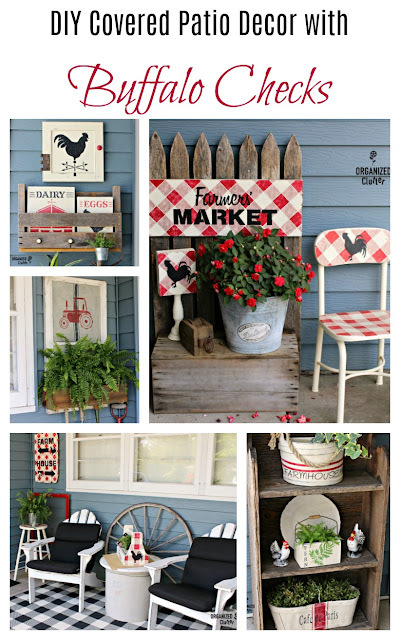 It makes me want to sit down and enjoy all the bright cheery décor. This turned out so darling! love it.